Every MantisX comes with a 45-day money back guarantee. The unit is shipped in a Pelican hard case from Oswego, Illinois, The battery is said to last 8-9 hours of use before needing to be recharged. A full charge takes 1-1/2 to 2 hours. The MantisX is extremely light and attaches to any firearm with a Picatinny rail or a rail adapter. You can use it with handguns or rifles, though it seems to be most appropriate for pistols. You download the app for your smartphone, in my case the Android app for my Moto G Plus. The app finds the MantisX unit immediately. You set your pistol down, in my case a S&W M&P9 2.0, and it calibrates the unit in motionless state for a couple of seconds. Now you are set for data acquisition, in either live fire, dry fire, or CO2 modes. This isn't a one trick pony type of device, either, for your wife, son, or daughter can use the sane unit on their pistols as well, as changing the unit over to another firearm takes only moments. You'll only need one MantisX for the whole family. 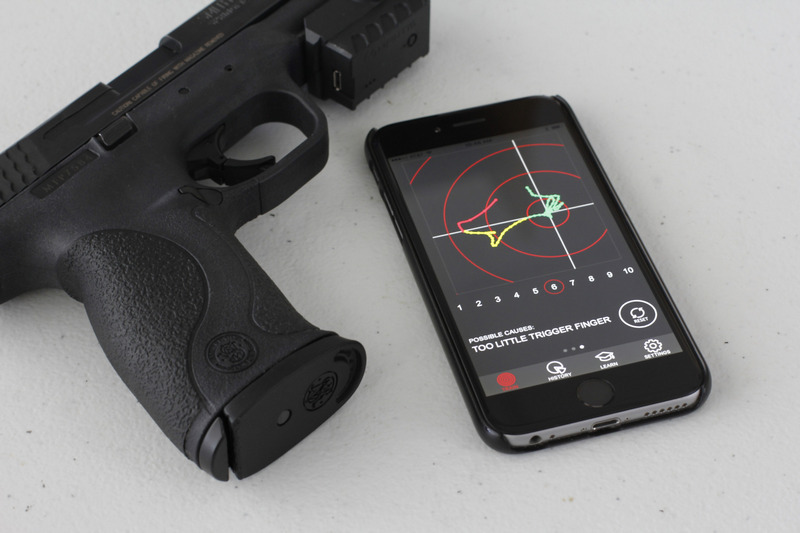 The MantisX precisely tracks your movement during trigger pull, gives you shot by shot analysis, and lets you know what is going on during initial targeting, firing, and after the shot. The old maxim that “accuracy and consistency are synonyms” couldn't be more true. Now, you can use the MantisX's sophisticated sensor coupled with the CPU of you smartphone to find the areas of your shooting that are inconsistent, whether stance, grip, trigger pull, and work to make them more consistent. Importantly, you can track your personal progress over time. This is a tremendous training tool that's like having your own personal shooting coach with you all the time. Absolutely highly recommended for anyone who wants to improve their handgun shooting: it works just as described, it looks to get even better as more features are added through regular application updates, so this is a product of lasting value. This a job well done by the folks at MantisX and should be a spectacular success if it isn't already. You can get yours today from https://mantisx.com/ . You'll be glad you did.